150 miles south of Jacksonville, FL on the St. John's River. The mailing list is a great success! 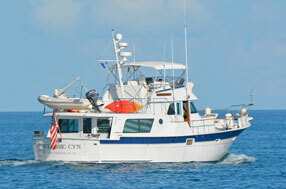 The Hatteras LRC Club mailing list is up and running with LRC'ers asking lots of questions about the boats. Its great fun to get email from boats from all over the world. Check out the new list of informative links. Remember your membership dues save you on your membership to BoatUS. What a deal? BoatUS has given the Club a reduced rate. 50% off the regular rate. Thinking of Joining the club? Fill out an Application online.